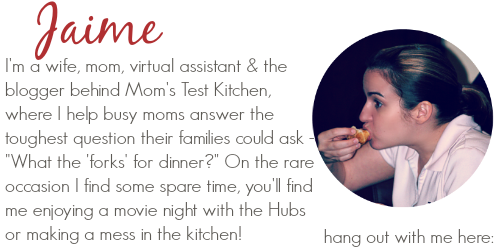 I’m so excited to introduce you to Jaime from Mom’s Test Kitchen! Jaime is the newest contributing writer for Eat at Home. I think you are going to love her recipes! Enjoy her first recipe for an easy side dish and give her a warm welcome! No need for dipping sauce on the side, get the flavors you love in this easy to make Ranch Glazed Carrots side dish! Our family eats a lot of meatless meals. It’s a great way to stretch our grocery budget, plus we just like to eat what I call ‘veggie plates’. Just like you would get in a restaurant, I make up two or three different vegetable dishes and some sort of bread & we pile our plates full of yummy vegetables. These Ranch Glazed Carrots are one of the vegetables I served up for our last veggie plate dinner. They tasted absolutely delicious, took about 10 minutes to prepare and since I was able to get the carrots on sale, cost just about $2 for the whole recipe! All of that pretty much makes a recipe a winner in my book! Cook the carrots in 1 cup of boiling water until tender, about 5-6 minutes. Drain the carrots & place them back in the warm pot. Add the butter, brown sugar & dry dressing mix to the carrots and toss to coat. If you enjoyed this Ranch Glazed Carrots recipe, you might also like these Easy Mashed Sweet Potatoes, Honey Glazed Carrots in the Slow Cooker or Parmesan Crusted Carrots! I got this recipe years ago from the Hidden Valley website, I think. My family loves it. I’m not a big fan of cooked carrots, but I make this dish for family gatherings sometimes. It’s always well received. Jaime’s expression, “What the ‘forks’ for dinner?” is cute! I think I’ll make a plaque like that for my daughter’s kitchen. Her pre-teen will get a kick out of it. Welcome Jaime! This dish sounds luscious. I’m wondering…WHY DIDN’T I THINK OF THAT??? LOVE me some Ranch dressing. Making this very soon. Love simple and delicious recipes like this one! Thanks to both of you for sharing. This looks amazing! I have been on the hunt for a new way to make carrots more interesting. Can’t wait to try it! These look great, Jaime. With 2 boys myself, and a hungry husband, I’m always looking for new recipes for veggies. I’ll give these a try. Thanks!